I had a speaker ribbon. I seem to have lost my November. Has anyone seen it? 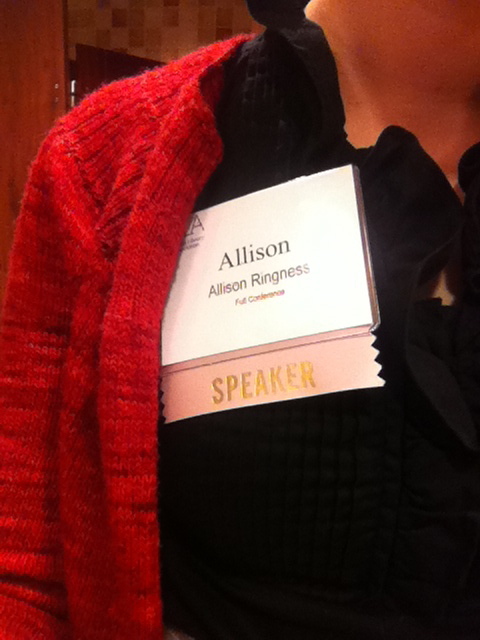 Let’s try to catch up here: the Arizona Library Association annual conference came off quite well. The poster session was a blast, because I was there with the rest of the super-cool AzLA Web Committee, and because it’s way more fun to have conversations with people than it is to speak to them while they stare holes in you. My big scary presentation, the one where my co-presenter and I stood at the front of a room for 45 minutes and spoke about roaming reference while 80 eyeballs bored holes in us, went off very well. I chose to present after years as an attendee because the two of us had a terrific project I wanted to share, and also because speaking in public still scares me. The only way I can get over that fear is by presenting, presenting, and presenting again. I was so glad to have my co-presenter: she helped talk me through pre-presentation jitters, and started off the presentation on the right foot. Overall, the conference was a great experience. I’m on the lookout for another presentation topic already: got to get over that public-speaking anxiety! Right after the conference I had a job interview. I know, I said I was going to focus on the jobs I had instead of looking for more. But some really stellar positions opened up, and I fell for them. The interview was a really positive experience. For starters, I learned that I can survive a day-long academic interview. I also identified some things that I would like to work on in future interviews. Polishing my presentation skills is on the list, of course. More jobs are being posted, finals are coming due…take a good look, because I think December is going to be gone pretty soon, too.